Former president Robert Mugabe's endorsement of Emmerson Mnangagwa after an ugly fallout did not come cheap. Mugabe and Mnangagwa's relationship broke down in November last year after the 94-year-old politician was toppled in a coup that saw him being replaced by his protégé. On the eve of the July 30 elections, the bitter former Zanu-PF leader declared that he was not going to vote for his "tormentors" and appeared to be endorsing opposition leader Nelson Chamisa. Former first lady Grace Mugabe, who was cited as one of the reasons the military rolled out tanks into the streets of Harare to oust her husband, waxed lyrical about Mnangagwa's generosity last week. The president's generosity did not stop with the chartered plane as he also donated over 1 000 litres of Mazoe Orange and mineral water. Mnangagwa also gave Grace's family other food items, that came in handy for the bereaved family, which had to handle a huge number of mourners in Chikombe yesterday. Zanu-PF secretary for legal affairs Paul Mangwana said although he could not confirm that Mnangagwa spent over $550 000 assisting the Mugabes, the gesture was justified. "I do not know how much was paid for the plane and I do not even want to know…but do you know that good politics is expensive. that's all I can say," he said. "Good politics requires us to treat our former leaders with respect and show compassion to them. "So whatever price you pay for ensuring that you send the right message to your future generations, that he sacrificed his life to liberate you and you want to show the young kids what it is to love…nothing can pay it back; so you can't put figures to love, you can't put figures to the correct decision. "I do not care how much it cost as long as it is good for our country and for as long as it is going to bring stability." 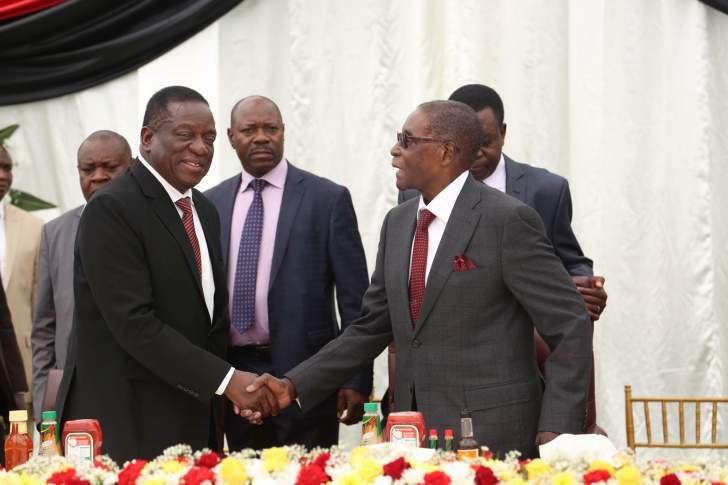 According to Zanu-PF insiders, Mnangagwa feels he needs Mugabe's backing to win over some ruling party supporters that are still sceptical about his leadership. During the July 30 elections, the new Zanu-PF leader performed badly in some constituencies compared to the winning ruling party MPs. "If you look at the election results, Mnangagwa performed badly compared to Zanu-PF parliamentary candidates and this showed that many people in rural areas did not accept his leadership," said the Zanu-PF source. "More so, the international community regards Mugabe highly, especially among African leaders. "So the death of ambuya Idah presented an opportunity for Mnangagwa to mend relations with his mentor." Mnangagwa narrowly avoided a run-off election against Chamisa with less than 32 000 votes, while Zanu-PF secured a two-thirds majority in Parliament. "Mugabe still has supporters in the countryside and it is in Mnangagwa's interest to have the old man on his side," the source added. "Besides that, Mugabe also needs the rulers to take care of him and his interests which are also vast." University of Zimbabwe political science lecturer Eldred Masunungure said Mnangagwa's gesture showed that he was desperate for Mugabe's endorsement as a way of dealing with lingering questions about his legitimacy. "It would have been allowable or understandable if the economy was performing well, but in a country with an economy marred by extreme distress, it clearly doesn't make much sense," he said. "But then, you need to understand what makes Zimbabwe politics tick - it is that we condemn it on the basis of economic irrationality, but from a perspective of political rationality, it makes a lot of sense. "So, it is really a case of economic rationality clashing with political rationality." Masunungure said Mugabe still had support within Zanu-PF and Mnangagwa understood that he needed him for political survival. "He clearly wanted to be bestowed the legitimacy that the Mugabes had sought to challenge," he added. "He wanted to win Mugabe's side. What Mugabe and his wife said tended to bestow some legitimacy. "Mugabe is still supported by a third of Zanu-PF members according to surveys conducted. "Mnangagwa scored politically, but in the economic sense, it was clearly unjustifiable." At the height of their acrimonious fight, Mnangagwa declared that some of Mugabe's farms would be taken away in line with government's one-family one-farm policy. A tearful Grace told mourners in Harare last week "if my mother's death is meant for our friendship to be back to where it was before, let it be so," as she chronicled how they used to be close with Mnangagwa. Last year, Mnangagwa's supporters accused Mugabe's wife of poisoning the then vice-president as the battle to succeed her husband reached a climax. Mnangagwa's backers accused Mugabe of plotting to impose Grace as his successor, but the veteran politician last week said he had anointed former Defence minister Sydney Sekeramayi to take over from him. He claimed that his plan was to retire during the Zanu-PF congress last December and those who staged the coup knew about his plans. Some of Mugabe's allies formed an opposition party ahead of the July elections saying they wanted to protect his legacy. Zanu-PF chairperson Oppah Muchinguri-Kashiri last month also accused Mugabe of working with Western countries that imposed sanctions on Zimbabwe. However, Mugabe's unexpected endorsement of Mnangagwa could have ended the fights. "The wrong that happened last November has been erased by his (Mnangagwa's) victory in the July 30 elections. "We now have a government born out of the constitution. I now accept his leadership and he now deserves the support of every Zimbabwean," Mugabe said, looking frail in video footage on an online television site. "Before the elections, I did not support him because he came through illegal means, which violated our liberation values that politics leads the gun," added Mugabe, likely ending the feud between the new president and his former mentor. Mugabe's forced resignation divided Zanu-PF and created mistrust between the army, on one side, and the police and intelligence agency, on the other, but the rapprochement could help overcome those differences and rally others behind Mnangagwa.